Richard Levi’s sparkling century after Rory Kleinveldt’s nine wicket haul took the headlines on a remarkable day at Wantage Road, as the opening days 15 wickets was followed by 16 wickets and 374 runs on the second. Kleinveldt took the five remaining Notts wickets in the morning as the visitors were dismissed for 151, the South African with a career best 9-65, before fellow countryman Levi’s better than a-run-a-ball 115 saw the hosts follow their 43 run first innings lead with 270 second time around, scored in a little over 50 overs. Set 314 to win, there was time for Kleinveldt to pick up his tenth and eleventh in the match as Nottinghamshire reached 33-2, a day that started and ended with Luke Wood as night-watchman – and had pretty much everything in between. 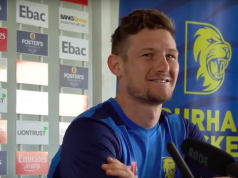 Having missed two months of the season with concussion, Levi was aware of the importance of his innings after injuries to Ben Duckett, who was later confirmed to have broken a finger, whilst captain Alex Wakely also suffered a blow to the face. “Beginning of the day, getting two wickets in the first two or three overs set it up for us. To get a 40 run lead on that wicket, you’d take it,” he said. “When the guys came out to bat we showed a bit of intent and they didn’t quite know what to do with it. We kept playing positively and it worked for us. “I’m just glad to be scoring runs. It’s been an up and down season, spending six to eight weeks on the side of the field. To come out and contribute in four-day cricket – I’ve always been told I can’t play it very well, but I seem to be scoring some runs. “Today with Wakers [Alex Wakely] struggling and Duckett with his hand, the batsmen knew we had to put on a good partnership and lucky it was me and Newts [Robert Newton]. Levi also praised his compatriot Kleinveldt, team mate at the Cape Cobras back in South Africa as well as at Northants, after a display that eclipsed his previous best for the state franchise back in March 2006. “It’s definitely his match. To get 9-fer is unbelievable. I was lucky enough to be on the side of the field when he got his previous best [8-47 for]; to be there today and see it from slip was unbelievable. “I’ll quote one of their boys: he had it on a piece of string, put it on his lengths, did what he wanted to do and bashed away at a length. After 15 wickets had also fallen on the opening day, Notts resumed 80-5, but quickly lost Root, who edged the second ball of the day to slip off Kleinvledt, before he trapped Tom Moores LBW for a single. Kleinveldt then removed Chris Read (17) caught behind and Brett Hutton bowled, leaving Luke Wood to club four fours and a six as the nigh-watchman made 44. He added 20 for the final wicket before he became Kleinveldt’s career best ninth victim – skying a caught and bowled. The morning wasn’t without its concerns for Northants, though, as Ben Duckett damaged his thumb in the slips, a blow that rendered him unable to bat. The ball before Wood’s dismissal, Wood hit one high over Alex Wakely at mid-off, the skipper running backwards dive was in vain and the ball rebounded off the turf into his face. He would later bat at number eight but the initial absence of two of their top three, with a slender lead of 43, looked crucial when stand in opener David Murphy top edged a pull off Wood with only four on the board. Levi, however, was coming off the back of a century at Cardiff last week, which needed only 95 balls, and was soon relishing his promotion up to number three as he and Rob Newton brought up a half century partnership – at the 22nd attempt in the match. Levi started relativity sedately with eight from his first 21 balls, but soon sprung into life, pulling Wood for six before taking Steven Mullaney for six boundaries in the space of eight balls, and launching Samit Patel’s first delivery over long-on to go to 50 in just 40 balls. Patel went for another six as Levi had reached 82 before Newton, who had very much played the support act, passed 50 for the eleventh time this season in 98 balls. However, like so often this season, he went soon after, guiding Hutton to Mullaney at slip. That sparked a mini collapse, Rob Keogh edging Hutton to slip five balls later before Mullaney took a fifth slip catch of the game and Josh Cobb edged Patel, a third wicket in 11 balls. With no sign of Duckett or Wakely, and the lead still under 200 when Kleinveldt walked to the crease, Notts might have sensed their opportunity. But Levi pulled Hutton for a fourth six before cutting a 16th four, to go to three figures in 92 deliveries. Kleinveldt was soon picking up where he left off, however, with four boundaries in his first ten balls. Hutton eventually got through Levi’s defences; his third wicket of a spell that had cost 55 runs in seven overs, perhaps summing up the day’s craziness. Mullaney finally put one down, as Kleinveldt cut Patel hard to him at slip on 22, and soon Nathan Buck, batting at what looked high at number seven, launched the spinner for two straight sixes. The pair added 47, having staged a similar stand in the first innings, before Wood returned to bowl Buck for 23. Wakely belatedly came to the crease, but Kleinveldt fell in the next over, having hit nine fours and a six. He top-edged the pull that would’ve taken him to a 41 ball 50, only for Brett Hutton and Matt Milnes to combine in a brilliant relay catch – the sort we see in T20 but rarely in the Championship – and Hutton caught it, diving over the rope and relaying it into play for Milnes to complete the catch. Northants would lose their last four for ten runs, as Wood bowled Ben Sanderson and Richard Gleeson with successive deliveries to finish with four for the second time in as many days. Kleinveldt has only taken10 wickets once in his career, the same game as his previous best 8-47 in an innings, but needed only eight balls to equal that mark as Mullaney lost his middle and off stumps. 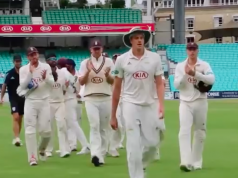 He then had an 11th for the first time as Billy Root, promoted to three in place of Chetan Pujara gloved a short ball to slip, and with eight wickets still left will be hunting for more as Northants look to keep alive their promotion dreams.